Let's take a look at the recent 'Game of Thrones' Season 8 theory that might very well come true. "Game of Thrones" Season 8 might not have the official release date yet, but every now and then an intriguing theory emerges from the "Game of Thrones" corners of Reddit or YouTube for that matter. Such was the case with the recent theory concerning Arya Stark and Jon Snow by YouTube user Gray Area, based off of some Season 8 filming news and pictures. So if you are not up to date with news from the set, you should know that this article will contain spoilers. Consider yourself warned. Now, with this out of our way, let's delve into this well-thought-out theory about Arya and Jon that might very well come true given the fact that it's backed up with some quite interesting ideas and clues from earlier seasons of "Game of Thrones" as well as from the "A Song of Ice and Fire" books. The fans have come to realize over the years that history quite often repeats itself in "Game of Thrones" universe. There is even a quote from "A Feast of Crows," a fourth book in the "A Song of Ice and Fire" series that kind of support this claim. When Theon's sister Asha (Yara in the show) is speaking to one of her (n)uncles Rodrik "The Reader" Harlaw he says that Archmaester Rigney once wrote that history is a wheel, because the nature of man is fundamentally unchanging, therefore "what has happened before will perforce happen again." But to be honest, history doesn't quite repeat itself. "History rhymes," Gray Area says in her video, before making the parallel between Daenerys in "Game of Thrones" Season 7 and Aegon "The Conqueror." Aegon landed on Dragonstone, and so did Daenerys, they both had three dragons at their disposal, Aegon had "The Field of Fire," Daenerys had "The Loot train attack," often referred to as "The Field of Fire 2.0.," and that's about it when it comes to similarities. All in all, history doesn't, by all means, repeat itself. That would make the story quite predictable, don't you think? History, instead, rhymes, as Gray Area brilliantly pointed out in her video. Now, with that in mind, let's talk about what events could repeat themselves in "Game of Thrones" Season 8. A few months back, some photos from "Game of Thrones" Season 8 filming set in Dubrovnik, Croatia (used for shooting King's Landing scenes in the past) that showed Kit Harington (Jon Snow) have leaked online. Take a look at one such picture down below. In the "Jon Snow's final suicide mission" article, I talked about how Jon will come to King's Landing to ask Cersei for some wildfire that could prove useful in the fight against the Night King who will, most likely, win the Battle at Winterwell. But Cersei, being, well Cersei, will throw Jon Snow in the dungeons a.k.a. "black cells," the exact place where Ned Stark was held captive in Season 1 before his execution. Gray Area points out that Jon Snow pretty much looks like the prisoner in these photos. After all, he doesn't have his sword and most notably, we see him with two men in distinct clothing (see a picture below) that matches that of Varys in Season 1 when he went to see Ned Stark in black cells disguised as the jailor. One option is, of course, that Jon Snow might die in King's Landing, just like Ned Stark, an idea which I talked about in the previously mentioned article. But according to Gray Area, he could very well be saved by someone skilled enough to get him out of those dungeons, one and only Arya Stark. "It would be a poetic justice," Gray Area points out. She couldn't save her father in Season 1 when she was just a little girl, but now, as a highly trained "faceless assassin" she might very well save her beloved brother, Jon Snow. What do you think about this theory? 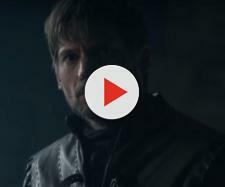 Tell us in the comments below, and don't forget to watch Gray Area's video down below for more details about this theory as well as for some other "Game of Thrones" Season 8 filming news.